Multiple layers of glass combine with corrugated metal panels to balance visibility and privacy in the University of Pennsylvania’s new research center. As an experiment in interdisciplinary research, the Krishna P. Singh Center for Nanotechnology at the University of Pennsylvania is not a typical science center. It follows, then, that the university would not want a typical laboratory building, with a central corridor and minimal public space. 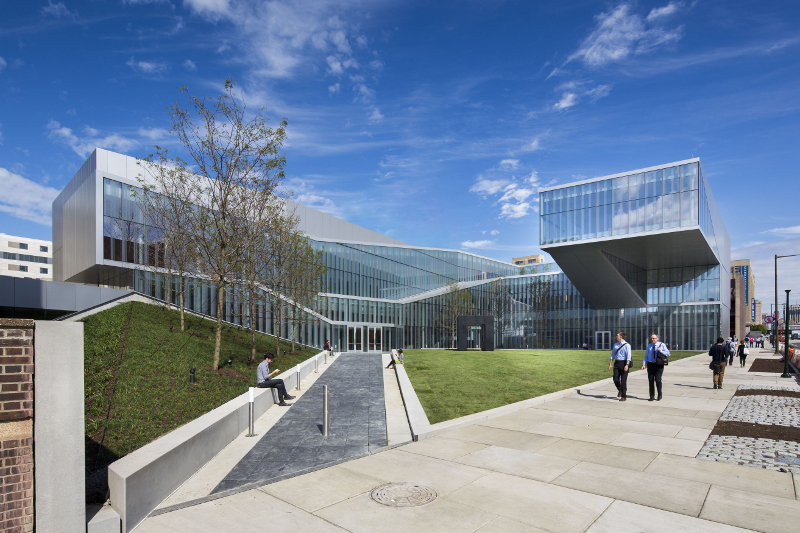 Instead, the University of Pennsylvania asked Weiss/Manfredi to design the Singh Center around two principles. First, the building should create a new campus green for the school of engineering and applied sciences, in keeping with both the university’s and the city’s tradition of building around open quads. Second, the building should maximize natural light and visibility without compromising the integrity of the research itself. The second layer of glass divides the Singh Center’s public spaces from its laboratory spaces. There, Weiss/Manfredi installed a laminated assembly with two layers of translucent frit. Again, the architects aimed for balance, this time between privacy and views out. Interior solar shades allow occupants to shut out daylight—or the eyes of passersby—when needed. 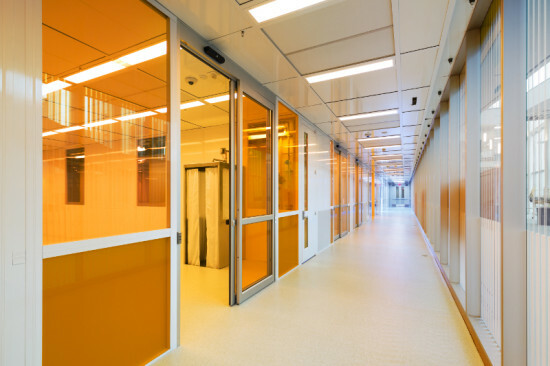 On the first floor, an amber glass interlayer demarcates the research center’s 10,000-square-foot Bay/Chase Cleanroom. The color protects the interior of the cleanroom from ultraviolet rays and specific light wavelengths in the visible spectrum without walling it off completely. “Cleanrooms are typically a closed thing, but you can walk in and see everything going on in [there],” said Harshman. Glazed in interior fritted glass, write-up offices front the laboratories themselves, allowing light to enter the general labs. “We really saw the sections—the exterior glass, interior, and glass on [the] labs—as one assembly,” explained Harshman. 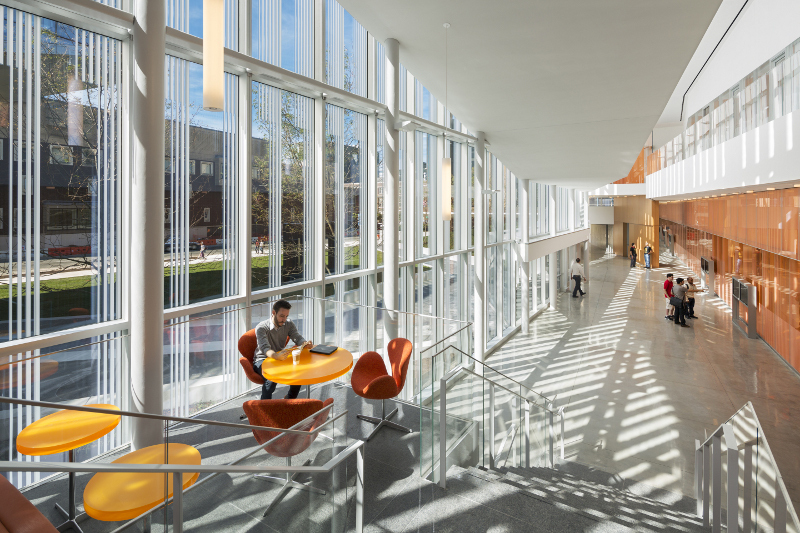 The design allows daylight to penetrate deep into the building, while the combination of patterned glass and solar shades protects both the researchers and their experiments. The Singh Center facade is not all glass, however. Far from it. “From some views it looks like it’s very glassy, but the glass only represents one-third [of the building envelope],” said Harshman. “The rest is opaque and very insulated. The question became how to clad that surface.” Weiss/Manfredi explored a number of materials, including champagne-colored metal to echo the surrounding brick buildings. 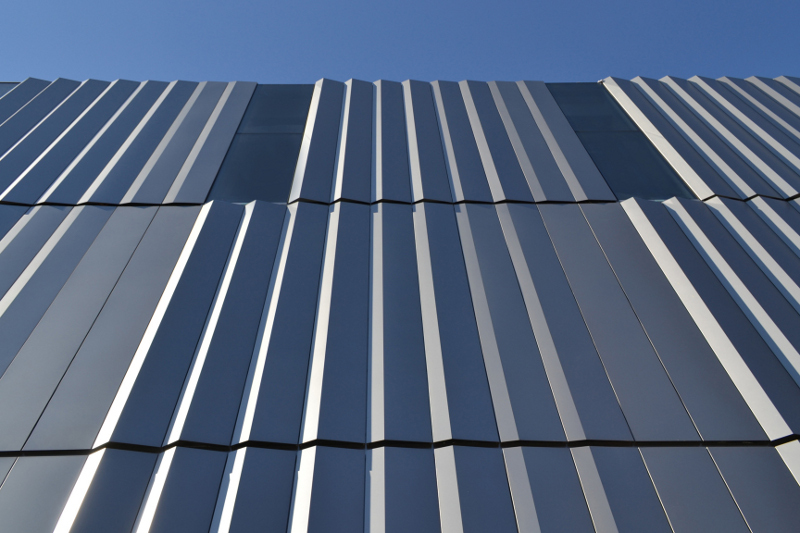 Ultimately the University of Pennsylvania chose silver anodized aluminum plate panels, explained Harshman, “because for them the context was technology.” The corrugated panels, which were fabricated and installed by Wyatt Incorporated with a custom finish by Spectrum Metal Finishing, were hung as a rain screen system over a prefabricated highly insulated exterior backup wall. “[There was] a great interest on Penn’s part that the project would have an aspect about scale and light. They liked the idea of the corrugated panels catching light at different times of the day,” said Harshman. 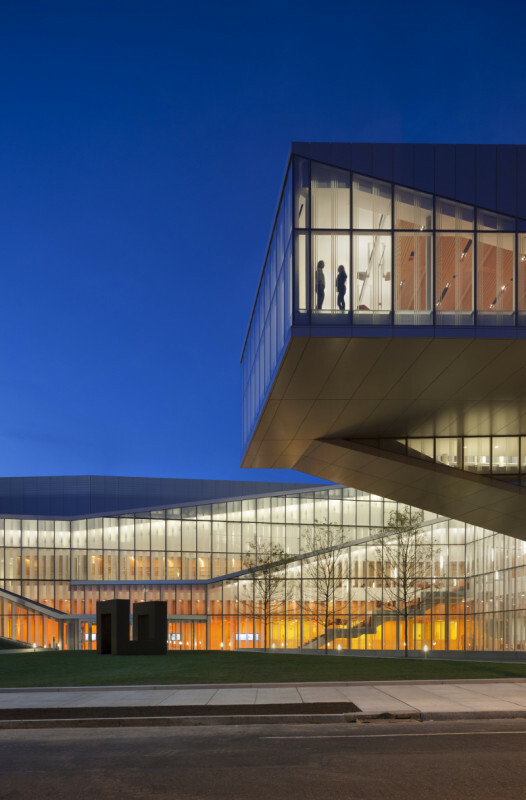 The logic of the Singh Center facade culminates in the Forum, the multipurpose conference space that cantilevers over the courtyard. Its back and sides wrapped in protective metal, the Forum’s front wall is fritted glass overlooking the main campus. As a result, the place where researchers present their work is also the most connected to the university and the community around it. In the Singh Center, the University of Pennsylvania did not have to choose between openness and an effective research environment. They achieved both, with a building that turns traditional laboratory design on its head.